With open spaces, wooden windows, and domes, Lotus Studio is winning for its view and is reminding us of the time we spent at our grandma's. Take one look at this tiny studio in Pondy (in Skandavan’s garden) and it feels as though our paati’s house just got a makeover. 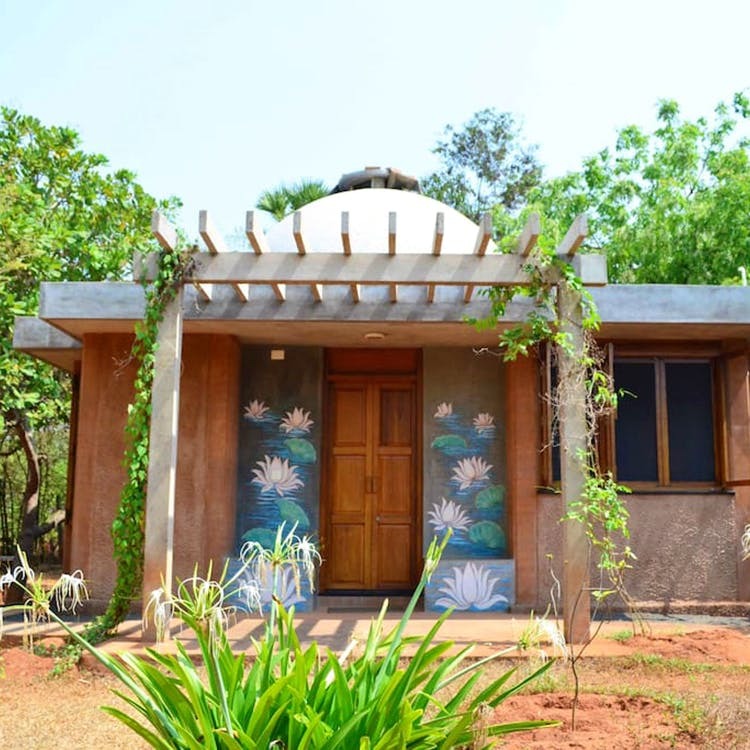 Its dome-shaped roof, bright blue, and orange mud walls, wooden windows with grills, huge and sturdy wooden door, and spacious rooms have a nostalgic vibe - just like old-school houses. Lotus Studio is in the middle of a garden with a large fish pond and is perfect if you are looking to run away from the bustle of the city. There’s a queen sized double bed, a compact kitchen, a bathroom, and long window ledge (to accommodate another bed). The private garden area has seating and will need no filter for your Instagram stories. The host of the house, Rekha is a yoga instructor. This means you could also sit for a class if you are interested. If dance is your calling, then you could make use of the dance studio space available right outside the house. You would require prior permission to use the space, however. Step out and you’ll be surrounded by trees and hanging terrariums - it’s like you’re in a cabin in the woods. It’s time to plan a Pondy trip, don’t you agree? There’s no WiFi, but who needs it when you can stare at nature’s beauty right outside? You can use the internet at the Rekha's home, which is right next to this studio.